It’s been a full 24 hours in Nova Scotia so far, and so far it’s going well. My Halifax friends are lovely hosts as ever, and today we ventured north of the big city towards the Wolfville area. My gravest concern, naturally, was to seek out Gaspereau Valley Fibres, which I’d heard from Kim was worth the trip. They are a great stop, are Gaspereau Valley Fibres. Very friendly, very browsable with maybe also some Fleece Artist seconds shhh it doesn’t count as a sock yarn purchase if it’s that much of a steal does it? I didn’t think so, and with a fantastic selection overall. My friend Jenn, pictured here, made out with a pair of skeins of Manos wool-silk, and a skein of laceweight. I was a bit more generous in my spending, but man, the wool fumes were strong, I couldn’t help it. The red is 8 oz of merino/bamboo blend from Frog Tree Fibers, which I am happily going to save for my spinning wheel days when I want to branch out into non-wool blends, and that enormous fluffy ball of goodness is 250g of merino/tussah silk blend. It’s soft like butter and it is also coming home with me for a rainy spinning day. 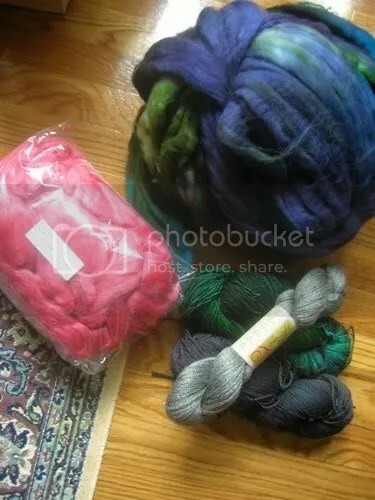 The yarns are 2 skeins of Fleece Artist seconds, in darker shades which I am trying to stash more of for sock knitting, and a beautiful, recently-produced find from Prince Edward Island – bamboo/merino/bison laceweight from Fibre-Isle Fine Yarns. I can’t even begin to talk about how soft this is. This silvery grey skein is about 600 yds and enough for a beautiful scarf or shoulder shawl. Delicious. 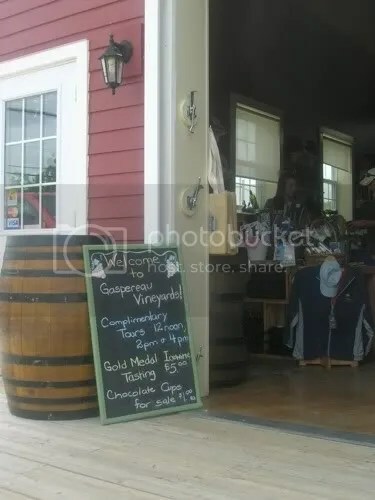 From there we carried on down the road to Gaspereau Vineyards, one of several vineyards in the area. 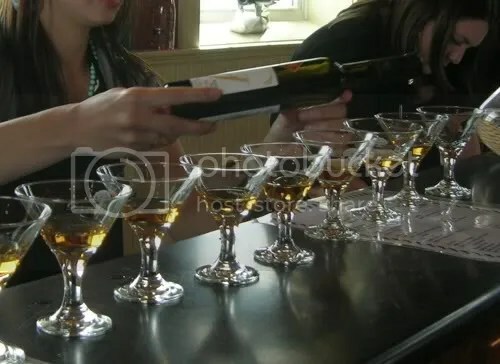 The tour was very informative, the wine sampling certainly made us a bit more relaxed, and in general it was a nice addition to the sunshine-filled day. A recommendable tour. And now I have some yarn, wine, and cheese to contemplate here chez my hosts. Yarn and wine, they just go together like…things that go really well together. This weekend’s just getting started over here. I hope yours is relaxing! Keep the knitting close by. Looks like a lovely, lovely visit! Just about a perfect day, non? Dang! I was in Halifax last fall and I didn’t get to any LYS outside of the city. Next time I will certainly hit this one. Thanks! Yarn and wine go together like a ball winder and swift or peanut butter and jelly. It sounds like a lovely day. Enjoy the rest of the weekend! It’s a lovely shop — I visited while at a conference at Acadia, when I was living in NB. A lovely area, all in all — I’m glad you’re having a good time, but not at all surprised! Yay! You made it! And you found the bathtub of wonderfulness! When I was there, it was full of hand dyed corridale locks. I’m insanely jealous of your haul and glad it was a good time! 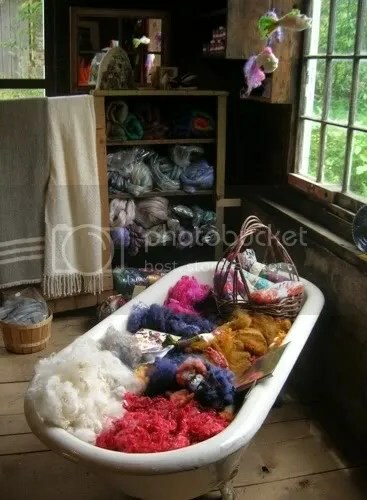 What a beautifully rustic full of delights yarn store!Big fluffy ball O’Fibre.. YUM! You did Very Well! Looks like you are doing VERY well in Halifax!! love that silvery grey yarn, such a find. Wine, yarn and cheese, lovely! Augh! I was in the Wolfville area earlier, but none of my friends had cars to make it out there – I’m glad you got a chance to, it looks lovely.